Patrick Byrne Piano Photo courtesy of John Hainstock Photography. To Listen to or Download Samples of Patrick Byrne playing piano, please go here. If you want to host a successful corporate meeting, retail event or private party you will want to pay close attention to even the most minor details. Inexperienced party planners often overlook a significant element for a successful party: the musical background. Don’t let this happen to you! Bands or DJs are fine for dancing (especially if it’s a big corporate event with hundreds of attendees in a large ballroom). But what about the casual drinks in the bar or the Reception or Social Time and Dinner? These are the vital first interactions or impressions that you want to foster in order to insure a successful party or event. Since everyone loves music, people are always happy to talk about it even with complete strangers. Having “broken the ice”, live piano music will continue to provide a sociable atmosphere for casual or serious conversations. I am available to play piano for a wide variety of events including bu not limited to: fashion shows, art exhibitions, birthdays, anniversaries, corporate or any other special occasion in private homes, restaurants, hotels, etc. I once even played piano for a Christmas Party for the women inmates at Chicago’s Cook County Jail! If your party venue lacks a piano, I have a portable stage piano and professional sound system that sounds like a Steinway! 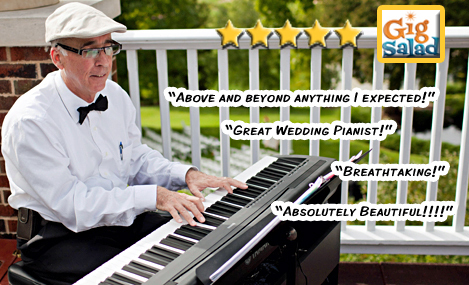 To request a quote for from Patrick Byrne to play piano for your Party or Special Event, Please call/text 262-893-1759, email Pat today or use the form at the bottom of this page. 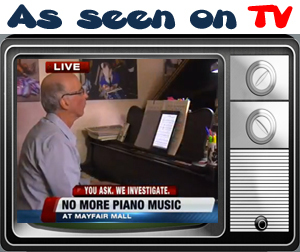 Remember, if your home or venue does not have a tuned piano, don’t worry, I have a Yamaha digital piano and professional sound system that I can bring with me to your location: Have Piano Will Travel!